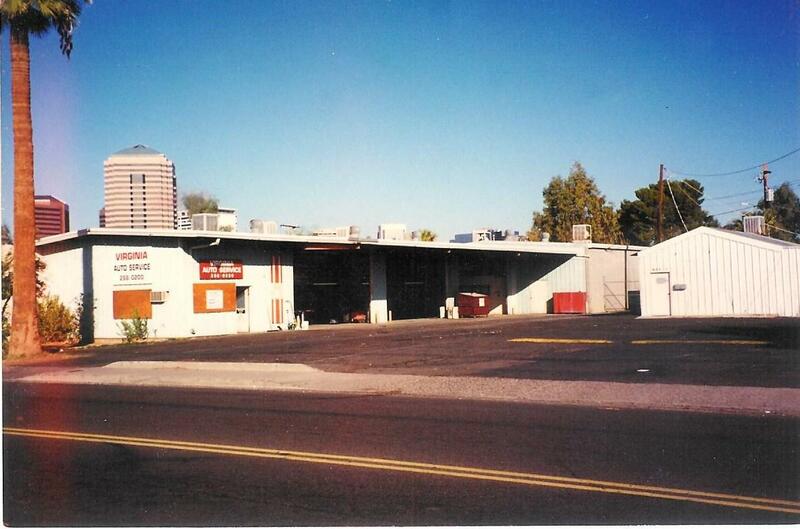 Virginia Auto Service 1994, prior to being purchased by Matt Allen. 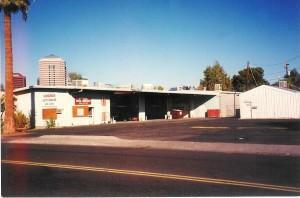 Virginia Auto Service is located in downtown Phoenix on the corner of 7th street and Virginia. It has been located there for over 25 years. This little corner of town is part of Phoenix history. In 1945 a World War II veteran opened his own auto repair shop on that very corner. He repaired cars from the surrounding downtown Phoenix area for more than 25 years. But the shop changed hands several times in the late 80’s and early 90’s before being closed up and allowed to fall into disrepair. In 1994 Matt Allen, a young mechanic, who had lived in the state of Virginia where he had first come to love working on cars, decided that it was time to act on his “big dream;” Matt had always wanted to open his own auto repair shop. So when he happened upon the boarded up old “Virginia Auto Service” shop, he took it as a sign from above; that Virginia Auto Service was meant just for him. While some people only saw the shop as a mess, Matt saw it as an opportunity. He had a vision of a Virginia Auto Service that burned in his brain. And so equipped with his vision, some tools, and some cleaning supplies, Matt began to work on transforming the broken down building into a growing, thriving business. Virginia Auto Service’s reputation for quality work and excellent customer service spread and for nearly 10 years the shop grew, adding mechanics and other personnel without ever losing that customer centric focus. Then in 2004, disaster struck. An arsonist set a devastating fire that destroyed almost the entire shop including cars owned by customers. Thankfully, there were three bays in the back of the building that were spared. Working from these three bays, Matt and his dedicated Virginia Auto Service team continued working while the shop was rebuilt. Even in the midst of this tragedy, the commitment of this Phoenix auto repair shop to its customers never waived. Matt Allen, immediately provided loaner cars to each customer whose car had been damaged in the fire. Each customer was sent a letter notifying them of the fire and assuring them that the team would continue to provide the same level of service while the main part of the shop was being rebuilt. It was a tough time, but with hard work and their consistent focus on customer satisfaction, the Virginia Auto Team persevered and rebuilt bigger and better than ever. Unfortunately, the tough times weren’t over yet as the years following the 2008 financial crisis saw several other Phoenix auto repair shops close their doors. But rather than withering under the weight of this new challenge, Matt Allen and his team of expert technicians pushed ahead. Instead of cutting costs, cutting corners, and cutting employees, Matt hired two new technicians. When other shops were focused on getting through, Matt was focused on investment and growth. It was still a challenging time but the hard work and perseverance of Matt and the rest of his team paid off. Call 602-266-0200 or click to schedule online.